I'm featured on today's Pieces of Me on Sibling Mine - thanks, Casey! 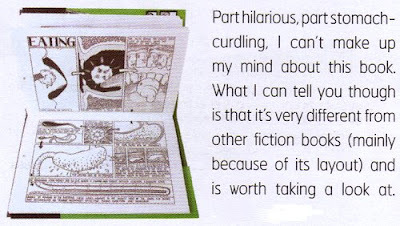 There's a review of my comic in the latest Design Indaba magazine (the snippet above is from there). Outer Tumbolia also gets a mention. And Emile popped up on Willow Decor a little while ago! Phew - what a household! You are all over the place! Well deserved recognition for your talent and hard work! Hi, famous Lady! Hope you had a good weekend. Congrats on being "in the news" again! I have a very sensitive stomach, but I will take a peek anyway.